Sean Lamont admits the feel-good factor surrounding Scottish rugby will be lost if the national side fail to beat Tonga on Saturday. The Scots followed up an impressive win over Argentina with a fine display in the 24-16 defeat by New Zealand. "We are looking to lay down a marker and continue what we've started," said centre Lamont. "If we don't, what we've done for the last few weeks is just talk, so we've got to keep this momentum going." 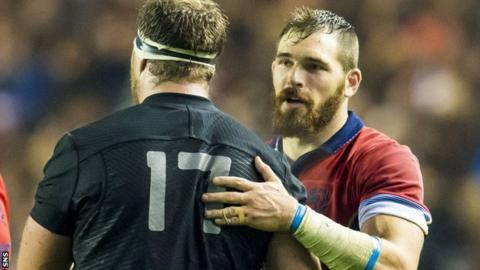 Vern Cotter's side beat the Pumas 41-31 in the first autumn Test and ran the world champion All Blacks close at Murrayfield on Saturday. The Scots have never beaten the Kiwis and while Glasgow star Lamont was gutted to lose out at the weekend, he is encouraged by the new-found self-confidence Cotter has brought to the camp. "It's frustration, but there's also massive positivity," said Lamont. "We held the number one team in the world to one point for 90% of the match, although that late try took the score a bit further apart. "It's one we could have and should have won, although there's been many like that for Scotland. "There is a lot of positivity, and the passion is back. "There is a self belief and confidence in the team. In the last few weeks it's been building and we need to continue that, not just for the Six Nations and the World Cup, but for the future of Scottish rugby." Scotland assistant coach Matthew Taylor also expressed his frustration at the defeat to New Zealand, although he refused to make too much of the missed penalty from Greig Laidlaw that would have edged Scotland into a 19-17 lead with 10 minutes to play. "It's a missed opportunity," he said. "We're happy with many elements of the performance but not getting the result was a disappointment. "You don't want to dwell on that [kick], there were lots of little things we could have done better. We want to build on that standard of performance and go into this weekend's Test against Tonga to get a win." Scotland lost 21-15 to Tonga at Pittodrie in 2012, the last time the nations met, and Taylor admits the players will be out to make amends at Rugby Park. "Last time out we lost to them so we need to put that right," he added. "We probably won't spend a lot of time going through clips of that game because it was two-and-a-half years ago. We're more interested in what they're doing now but certainly the boys were disappointed in their performance that day, so they'll be looking to do a lot better."